For the past 12 years he has been a fixture in the Hudson Valley. 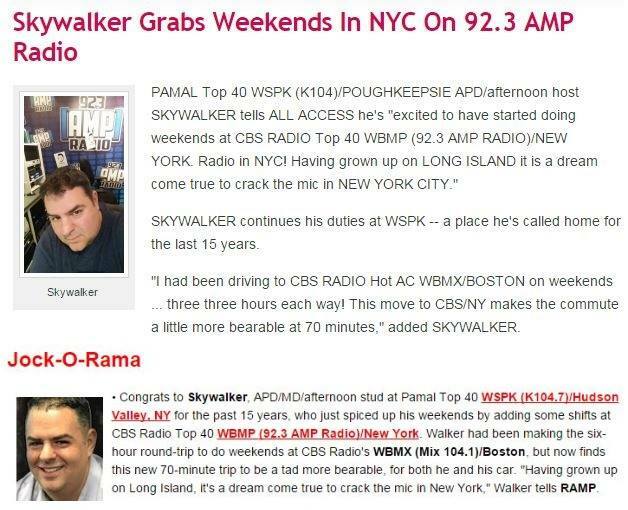 The well respected Skywalker juggles his daily duties and also can be heard every day via voicetracking on three other stations (WBPM/Kingston, NY, WZMR/Albany, NY, WZRT, Rutland, VT). 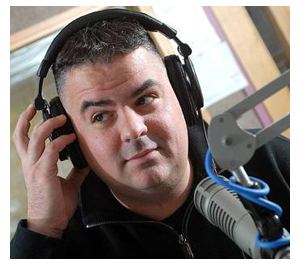 He also does weekends at WMRQ/Hartford, WBMX Boston and WWRX New London, teaches a communications class at Orange County Community College and writes a weekly newspaper column. To say he’s busy is quite the understatement. He’s been fortunate to have learned under the tutelage of PD Scotty Mac. Those lessons learned have paved the way for Sky to continue to develop as a programmer and air talent. When it comes to social media, he was on board ahead of the curve and utilizes his knowledge in that area to the fullest. Hard work, passion and focus are the reasons why he’s consistently #1 in afternoon drive in the Hudson Valley. First off, congratulations on being #1 again in your afternoon time slot. How many years in a row have you done this? Let’s just say I consider myself extremely blessed to be given to the tools to perform. I don’t take anything for granted. I am extremely proud of K104 as well as my show. From 2 p.m.-7 p.m. I drive the ship and to be the most listened to show in our market is extremely gratifying. I credit my company, Pamal Broadcasting, for letting me do what I do everyday. I started at K104 in December of 2000 and have just recently celebrated my 12th anniversary here. My show has consistently been on top with varying competition through the years. We are now part of the newly created Hudson Valley market which tells a better story of the reach of our station. It measures Orange, Putnam, Westchester, Rockland counties and K104 continues to perform well amongst the NYC radio stations. I will stand by our quality any day. Between your daily duties at the station and voicetracking stations, as well as teaching a weekly class and writing a column for the Times Herald-Record, you have to be a master at time management. How have you balanced all that and retained your sanity? I would say time management is my biggest attribute. I keep my hands in a lot of things, not to remain busy for arguments sake, but to keep myself a marketable and diverse talent. You can’t always control the future but I can control a lot of aspects of the present. I take a look at the day and how to best attack what needs to be done. I am lucky that a lot of my duties are not time specific. The only thing I HAVE to keep to is my airshift in the afternoon. The rest of the items I complete when it works best. I have a home studio now as well which I have started to use. I think working at home is a double edged sword. It’s a convenience but can also become a distraction as the couch is just a few feet away. As far as my voicetracking I try to work one day ahead and make timely updates as needed. I have remained sane. An occasional adult beverage calms ones inner chi. Last month you wrapped up the year with another successful KFEST concert event. What have been the keys to making it such a success? The majority of the credit I will place on my Program Director Scotty Mac. He has a knack for booking talent at the right time as well as our amazing relationships with the labels. Record companies enjoy the atmosphere and stage we provide on KFEST Sunday. Having done twelve K-Fest’s in my tenure here it has basically become a machine. It is definitely a WORK day for me. I don’t really get to “enjoy” the show but my satisfaction comes from the feedback from listeners and clients as to what a great time they had. The goal each year is to put on as good as a show as the previous year’s, but obviously from a business sense produce more revenue. We have come up with creative marketing and sponsorship opportunities to do so as well as merchandise and revenue sharing. We really start working on the next year’s show soon after one is completed. The challenge is where we are geographically located. There are limited venues. We are just north of NYC and just south of Albany. Two places where large scale shows are put on. There is no 20,000 seat venue in our backyard. We use a minor league baseball stadium as the site for our show holding about 10,000. This is a challenge as it’s not obviously equipped like a concert venue, so staging, dressing rooms, etc. are all things we need to create. We have done a great job and have made the concert a profitable venture for the company as well as a branding homerun for our listeners. You and Scotty Mac share a great working relationship. What have you learned from him and how has that made you a better programmer and air talent? Scotty has the ability to think beyond the programming box and is able to “hear and understand” other department’s needs. He understands what it takes to make everyone “play nice” with the common cause of a great product. I respect and admire this attribute. He gives me the autonomy to be an effective Assistant Program Director and air talent. He is our best kept secret. I have also learned, well maybe I should say observed, the art of “patience.” He has more patience than I do in certain aspects. I am truly trying to adapt that. I also admire his brevity in emails. I can count on two hands the amount of “all staff” emails he has sent out. TALK to people IN PERSON. Yes email is a business tool, but the human contact is the ultimate. Your station was actively involved in assistance after Hurricane Sandy hit. How did that all come together and what did you do to help out? I need give a nod to our morning man Woodman and his crew and Promotion Director Megan Denaut. The moment we went on air and said we were collecting items to be distributed to the areas in need our parking lot was INNUNDATED to the point of we needed to STOP the donations. Then beyond just collecting the items the morning show and Scotty went to New Jersey and Queens themselves to deliver. It was above and beyond any “radio charity collection” I’ve ever seen. We are a live radio station with a human in our studio 24 hours a day. We have a broadcast responsibility to be there for our community in times of crisis and need. I am pleased to say we fulfill this responsibility more than adequately. What are the advantages of working at a smaller company? I know the owner Jim Morrell. An answer to a question is 60 miles north and easy to get. It just cuts a lot of red tape. We have some great programming and on air talent in our company and it is fun to easily network with each other. I am thankful to Jon Reilly the OM of our Albany cluster, Ally Reid of WFLY as well as former PD Kwame Dankwa and current PD Amber at our Vermont cluster for giving me the opportunity to voicetrack in their markets. When I do my voicetracking I treat it as a live shift as much as I can. There is no “throwaway” shift. These Program Directors have trusted me with one of their dayparts and I take that very seriously. Even though I am not physically in their studios I am going to give them a damn good product as if I were. How vital has the digital space become in helping with brand extension and generating revenue? Our company is fully committed to revenue and branding via digital initiatives. We have an NTR department which has since evolved into an Interactive department headed by Steve Vittoria and our Marketing and Event Manager Deanna Miller. Steve provided education to the salespeople and different ways to gain ad dollars using our web, web stream and texting platforms. Deanna is also a graphic artist and her creative touch is a brand extension to each of our properties. Selling a sixty on-air commercial is not the only way to bring ad dollars to the cluster. Having the support of the company and this department contributes to our bottom line. It is ever changing and evolving and we are sure to keep up with the digital landscape and how to best use it to our advantage. Peep at our website at www.k104online.com. Your station is not known to lead the way on Rock-leaning records, but have there been a few that surprised you that went on the air earlier than they normally would? It is the advantage of being a mainstream CHR. We can lean however music is leaning at the time. Our Music Director Michael Bennett and Scotty of course look at the charts, sales etc., but have the freedom to play songs on gut and just sonically.Mumford and Sons on K104 is awesome! A great song is a great song and if the story fits K104 we will play it. If you are going to list markets playing the song that mean nothing to us in the Hudson Valley you aren’t going to get very far. What should up and coming talent who want to elevate their careers to the next level know to better prepare themselves for that next step? Find a mentor….someone who will take an interest in you and guide you. Also be diverse. Gone are the days of air talent ad’s that say, “Wanted: Night Slammer…Hot Phones.” Today, you need to bring a lot more to the table. The reason I started teaching a college broadcasting class is that when I was in college I learned the X’s and O’s of how to write a newscast but no one ever told me what it was REALLY like to be in radio. The good, the not so good and so forth. I said that if I ever got the opportunity to give prospective broadcasters the FULL picture I would. I have taught (and hired students) for the past few years. It has been an awesome experience. These students come into your classroom knowing nothing and leave with a final project and skills that you have given them. It is a feeling like none other of pride. I have a lot of friends who are teachers and now I understand their passion. Which programmers and stations do you admire the most? Besides my PD and our station, I love WFLZ/Tampa and Tommy Chuck’s direction of that station. Also I drive three hours each way from New York to Boston to do weekends at CBS’s WBMX. Jay Beau Jones was my original PD there and APD Mike Mullaney has been running the ship day-to-day. I have grown to love Boston and pinch myself each time I do a shift there. The talent and sound on that station is incredible. I think it’s the best Hot AC in the country. I may be biased but they do things right.Sharon Dastur and Tom Poleman have been very kind when sending them an “updated aircheck” throughout the years. I admire what they have done with Z100. Talk a bit about your Sky Sky Media website. Thanks for asking. Please check it out! www.skyskymedia.com It is basically EVERYTHING about me, what I do and what I can do. I am currently on 7 radio stations in a variety of formats while doing a plethora of other things. This is a professional showcase of who I am and I am very proud of it. I am open as to what the opportunities the future may bring. I’d love everyone’s thoughts. I wanted a website that reflected me, was easy to navigate and update. Your digital footprint is so important these days that I really wanted to have a place I considered a perfect representation of me. I found a great web designer and worked with her giving me everything I needed to put this labor of love online. Who have been significant influences on you throughout your career and what did you learn from each of them that have stuck with you? Scotty Mac and Al Levine (WBLI) are the two people that have had the most influence on my career. Scotty on a daily basis, but I can never forget the foundation and aircheck sessions Al gave me. He is still the smoothest in the business. I’d also like to mention “Mr.Voice” Mark Driscoll. I do the imaging here at K104 and Mark (as well as Ann DeWig) are our voiceover people. Mark’s input and guidance has been invaluable. I also want to mention Kid Kelly. I appreciate how Kid would respond back to me when I was a newcomer in the business. He always had time for a quick communication and that always stuck with me. One of my professional pet peeves is non-responsiveness. I am extremely aware of how busy we all are today but always keep professional courtesy in mind. It may take me a few days but I WILL get back to you. Do you have a bucket list of stations you would want to do a shift on? I am a radio geek, so yes. I WILL crack a NYC mic in my career. 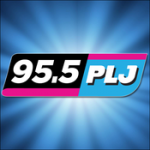 I grew up on Z100 and PLJ. 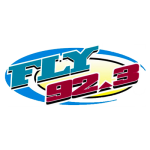 Out of the area, my favorites have always been Q102/Philly and 93.3 FLZ/Tampa. I was lucky enough to achieve my #1 station as the first station I was on, WBLI Long Island. I grew up listening and it will always be my sentimental favorite place ever working. 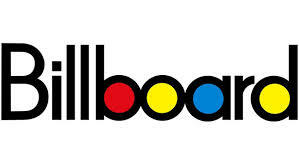 via FMQB: Radio Industry News, Music Industry Updates, Arbitron Ratings, Music News and more!.